Early detection of malignant lesions could improve both survival and quality of life of cancer patients. Hyperspectral imaging (HSI) has emerged as a powerful tool for noninvasive cancer detection and diagnosis, with the advantage of avoiding tissue biopsy and providing diagnostic signatures without the need of a contrast agent in real time. 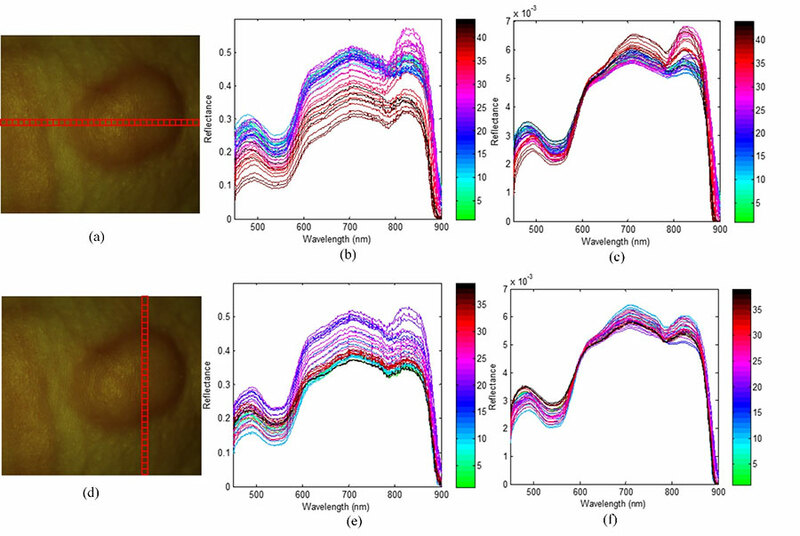 We developed a spectral-spatial classification method to distinguish cancer from normal tissue on hyperspectral images. We acquire hyperspectral reflectance images from 450 nm to 900 nm with a 2-nm increment from tumor-bearing mice. In our animal experiments, the hyperspectral imaging and classification method achieved a sensitivity of 93.7% and a specificity of 91.3%. The preliminary study demonstrated that HSI has the potential to be applied in vivo for noninvasive detection of tumors. Effects of the pre-processing on spectra as selected from different regions of a mouse image. (a) and (d) are the same ROI covering the tumor area; the horizontal and vertical locations are composed of square areas of “10×10” pixels. (b) and (c) shows the average spectra of each square from left to right before and after pre-processing. (e) and (f) shows the average spectra of each square from top to bottom before and after pre-processing. Spectral-spatial tensor representation of hypercube. Image stacks on the left is the hypercube of a tumor-bearing mouse. Images stacks in the middle shows that a hypercube (J_1×J_2×J_3) can be divided into small patches. Image stacks on the right shows that each pixel inside a hypercube can be represented by a small patch centered at that pixel. This patch containing information from both the pixel and its neighborhood can be represented in a mathematical form of 3D tensor. 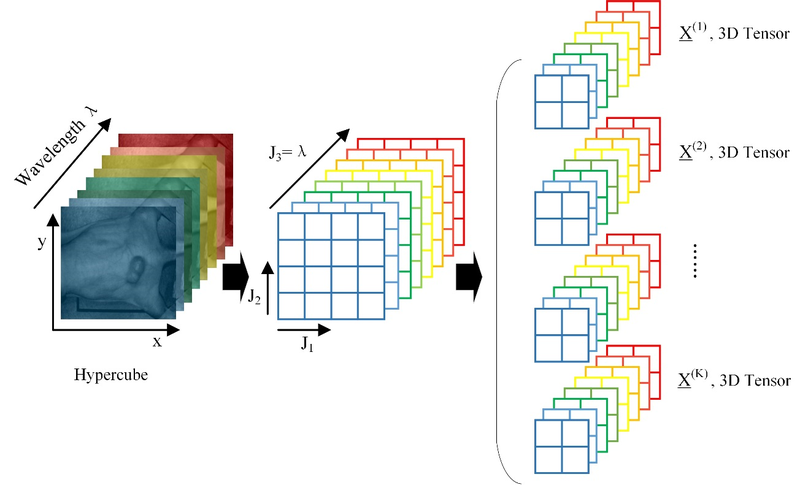 Tensor decomposition and feature extraction for the classification of tumor and normal tissue.